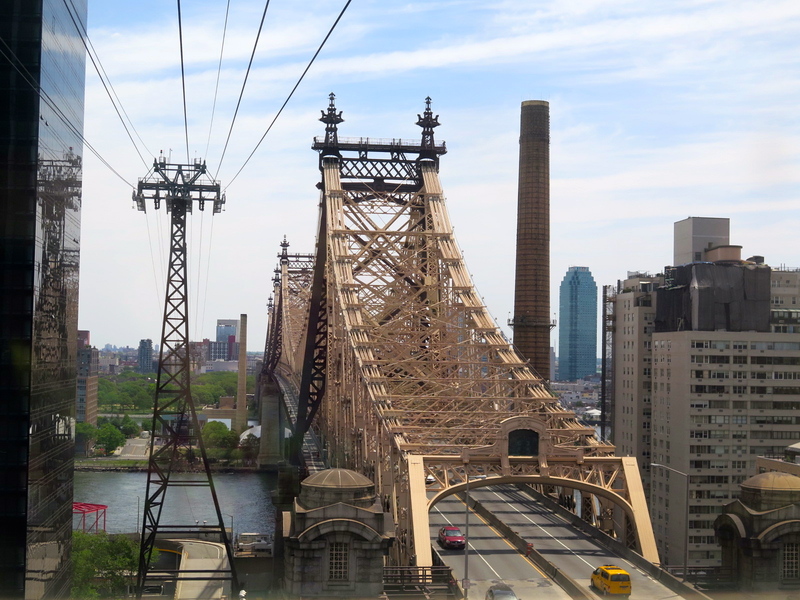 Roosevelt Island: Just Take The Elevator on the Queensboro Bridge? For many many years, too numerous to ever want to recall, I travelled by express bus to and from work. In the beginning, I worked on the east side of Manhattan so the commute was fairly quick around 30 minutes. Unfortunately for the last dozen years my ad agency was way downtown, across the street from what is now The Freedom Tower (formerly World Trade Center). This daily trip on a good day took 1.5 hours – good thing I loved my career. 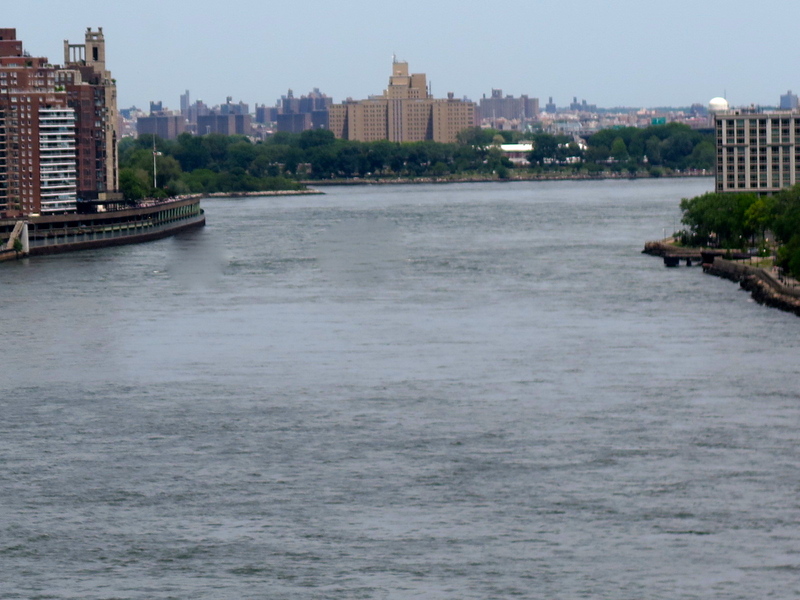 The route home was usually across the Ed Koch Bridge aka 59th Street Bridge or Queensboro Bridge. 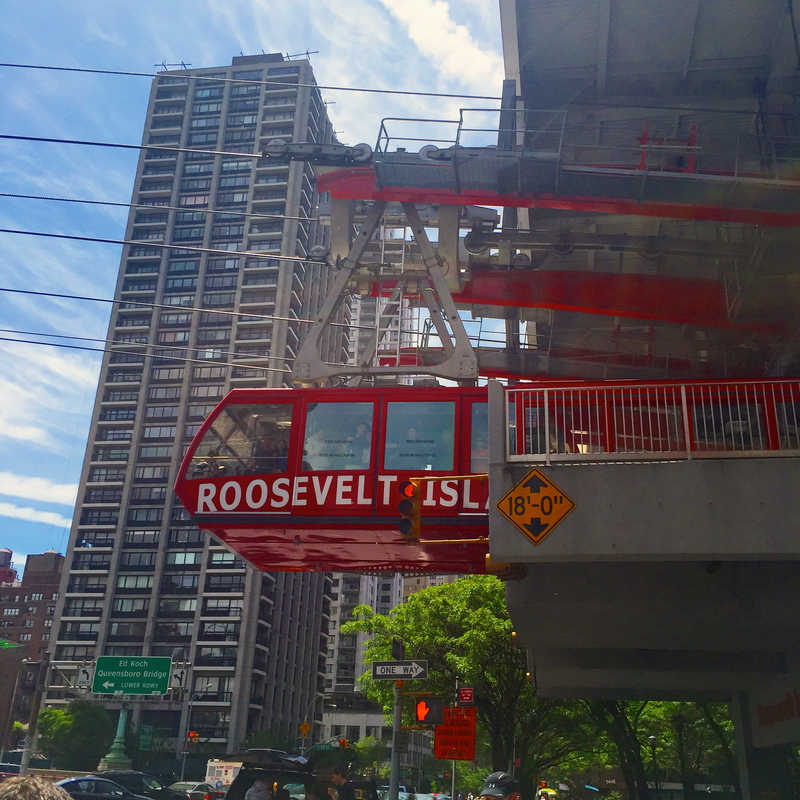 Every night we would pass over Roosevelt Island, another one of those local places I had never visited and the fascination for the slice of land was increased by the fact that the main vehicle to bring you there is the Roosevelt Elevated Tramway. 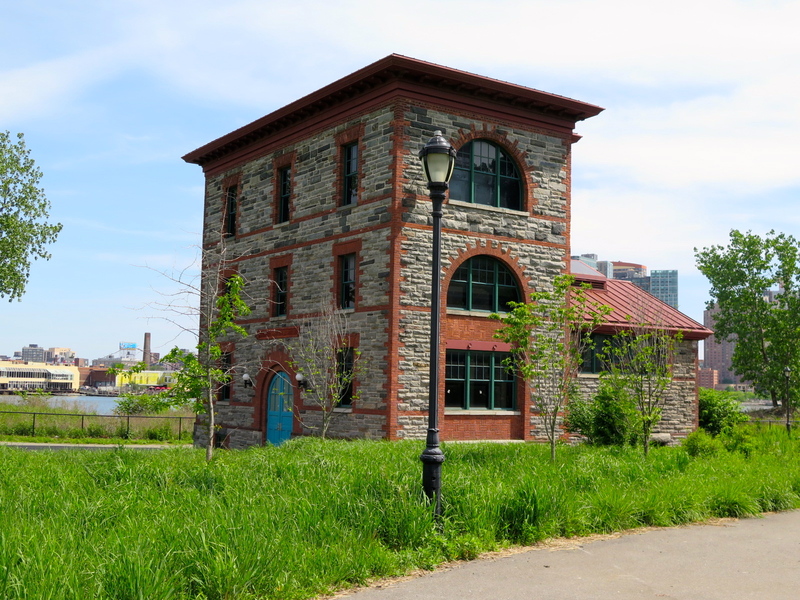 Ironically the Tramway, which began operations in 1976 was only supposed to be temporary transportation pending completion of the RI’s subway stop, but with the help of long delays on the train station construction as well as its own inherent charm, the tramway quickly became the symbol of Roosevelt Island. So on a perfectly beautiful day, I drove into the city, parked and boarded the tram which runs every eight minutes non-rush hour. 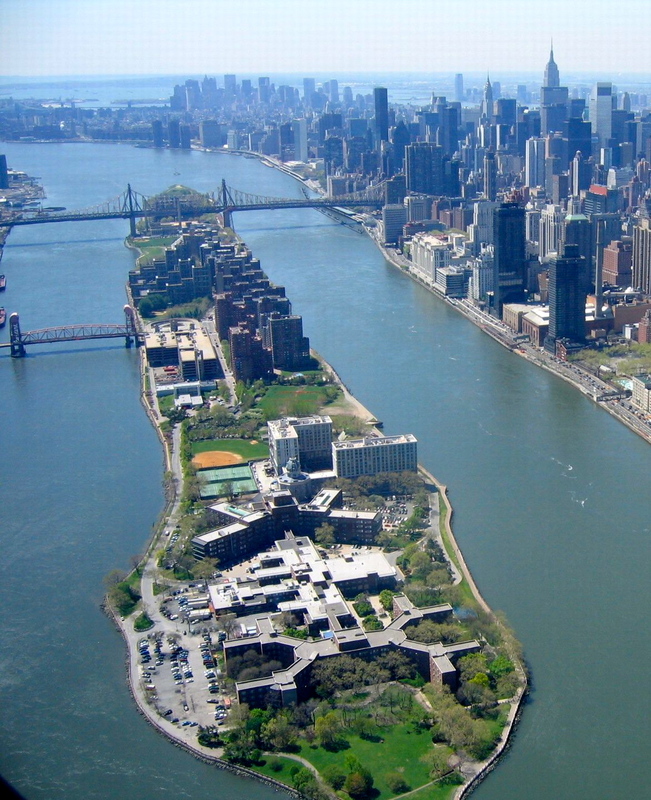 I was to meet my cousin on Roosevelt Island as he was coming from another borough and had elected to take the subway. Yes there is a train that goes to RI, but only since 1989 (it missed its planned opening by 13 years – more on that below). 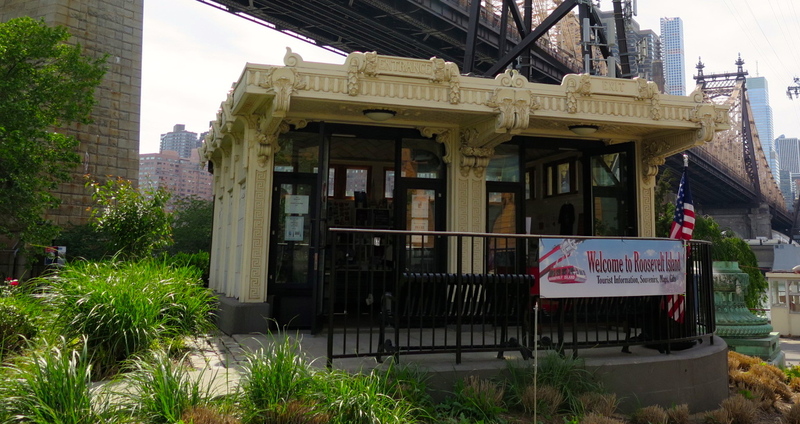 The meeting place was the Visitor Center which has a history of its own as it is housed in a kiosk that originally stood on the Manhattan side of the Queensboro bridge. The significance of that kiosk shall remain a mystery for my readers – just for a short while, I promise. 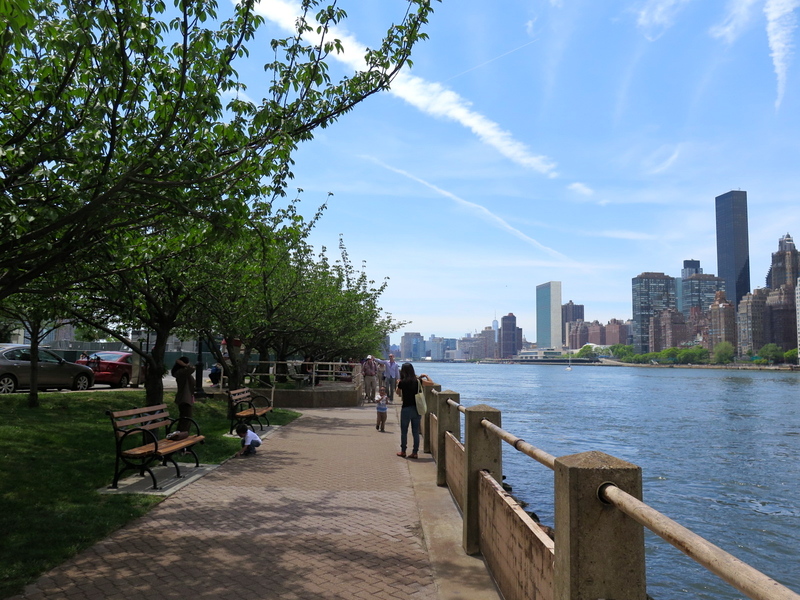 While Roosevelt Island is presently the site of a prettily landscaped middle-class apartment residential community (more on the Island’s housing status later) built under the reign of Mayor John Lindsay in the late 1960-70’s – there are about 12-150,000 full-time residents. A number of charitable hospitals and almshouses, chronic care and nursing homes also are opened on the island and in 1921 its name changed again to Welfare Island. 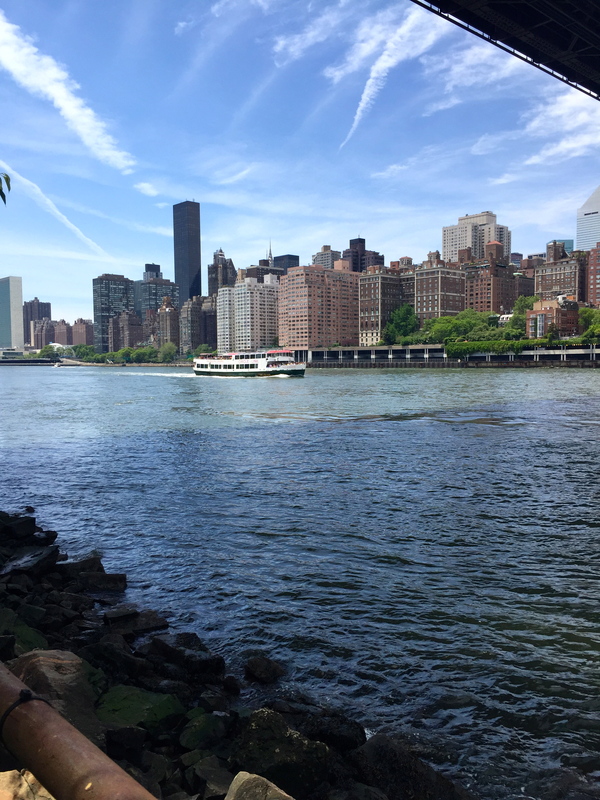 Its current moniker, “Roosevelt Island” was not bestowed upon the island until 1973, named after the one-time New York Governor and US President, Franklin D Roosevelt. While this island has gone through so many iterations, particularly from its somewhat ghoulish era as a place to stash aways criminals and contagious patients, what really piqued my interest most was a seemingly mundane area – the simple feat of getting on and off the island itself. What I found out was amazing. For this story, let’s go back to that kiosk. Trolley streetcars can still be ridden in San Fransisco and many parts of Europe, but they are a distant memory for New Yorkers. 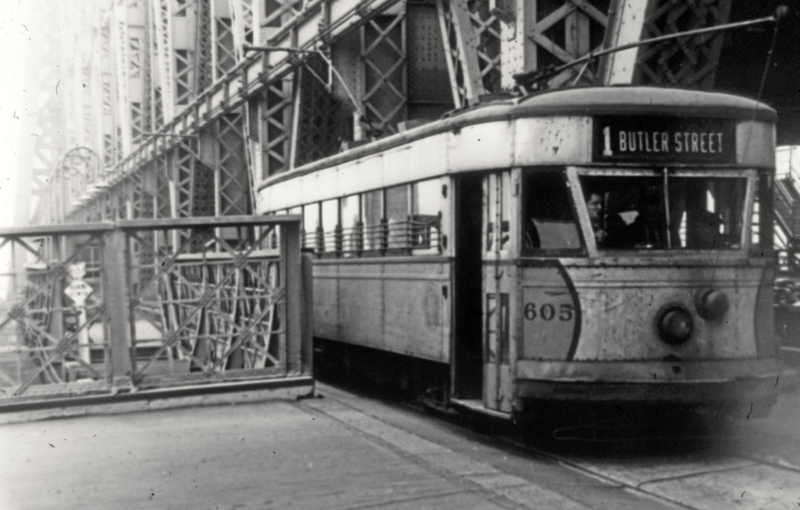 The trolleys ran on the lower roadway of the Queensboro bridge (it still has an upper and lower roadway) and connected Manhattan to the borough of Queens. 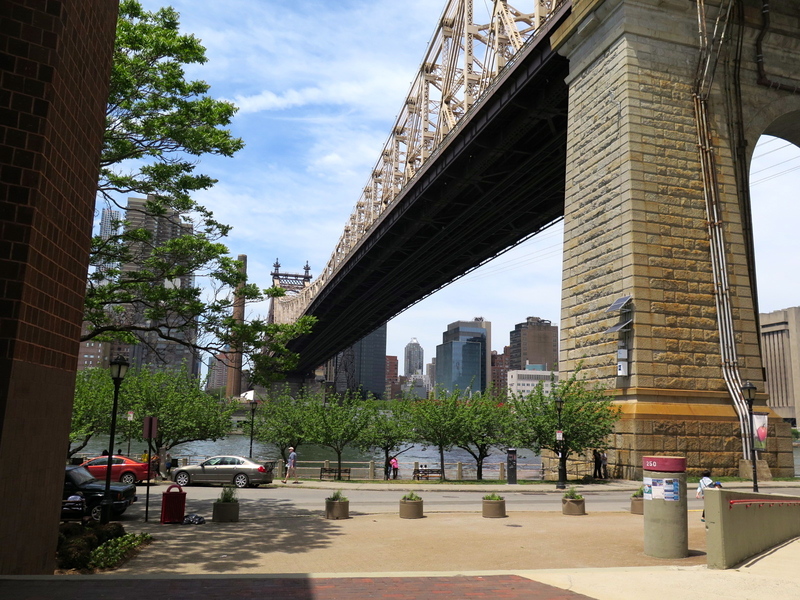 They were also part of a unique access to Roosevelt Island for, beginning in 1930 the trolley cars would stop at a traffic light in the middle of the Queensboro Bridge and let their passengers off to take an elevator or a set of stairs that connected the bridge to the island below. It’s interesting that while I was pretty young when the trolley system operated on the bridge until 1957 and when the elevators and stairs were removed a year later, I don’t even have a memory of when the vehicular elevators were demolished in 1970. Thanks to the internet I can see what I missed. 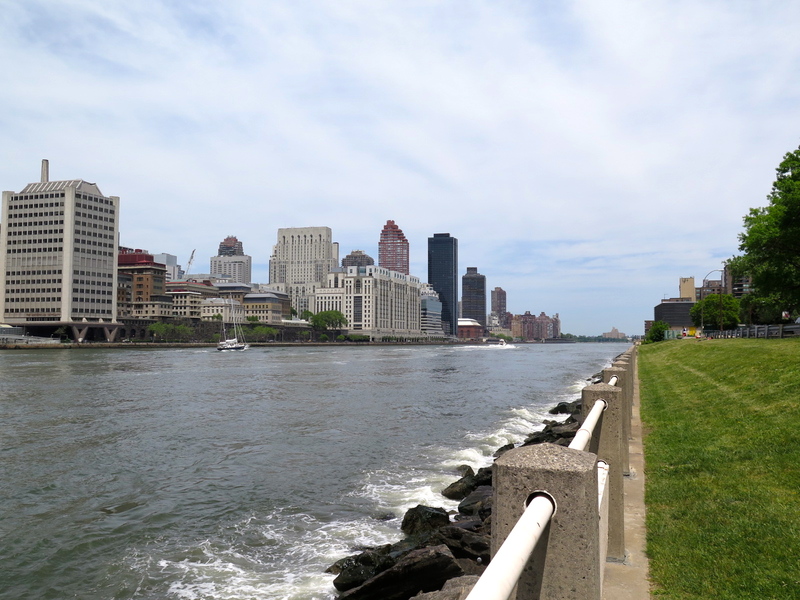 Roosevelt Island has never been this funny! Buddy Hackett’s one-bedroom, 1½-bathroom co-op at the Rivercross, 531 Main Street, is currently on the market for $690,000. 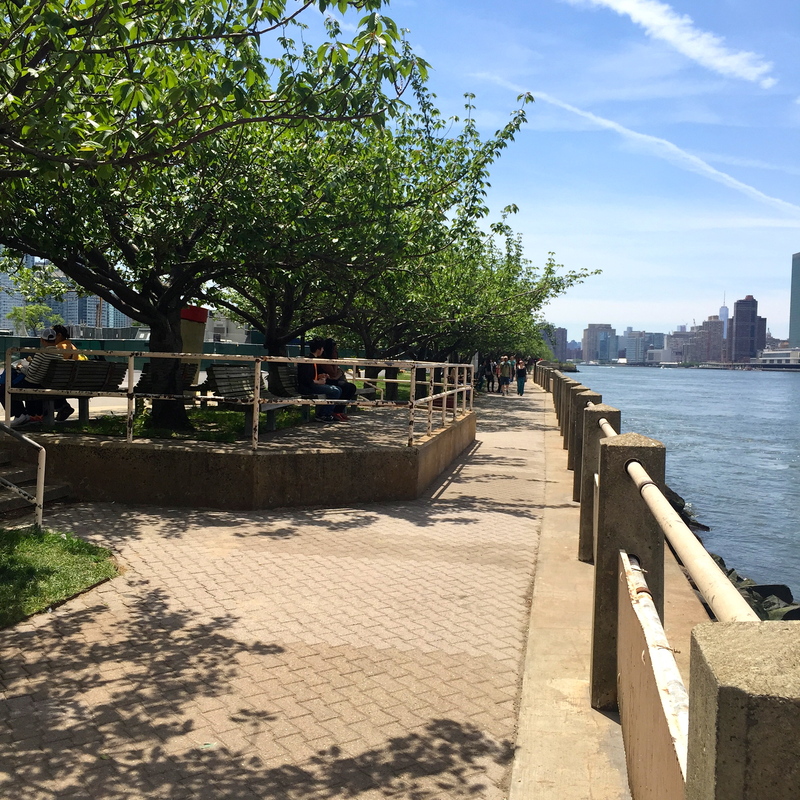 Buddy, one of Roosevelt Island’s most famous residents, was a beloved actor and comedian best known for “The Music Man,” “It’s a Mad, Mad, Mad, Mad World “and “The Love Bug.” The corner unit comes with great river views. The current owner is Buddy’s son, the actor Sandy Hackett. The listing broker is Suzanne Wolf, of Corcoran. C’est la vie – right cuz? This entry was tagged 59TH STREET BRIDGE, ED KOCH BRIDGE, HOG ISLAND, METROPOLITAN HOSPITAL, MIDDLE INCOME DEVELOPMENT, NEW YORK CITY LUNATIC ASYLUM, QUEENSBORO BRIDGE, ROOSEVELT, ROOSEVELT ISLAND, SMALLPOX HOSPITAL, WELFARE ISLAND. Bookmark the permalink. 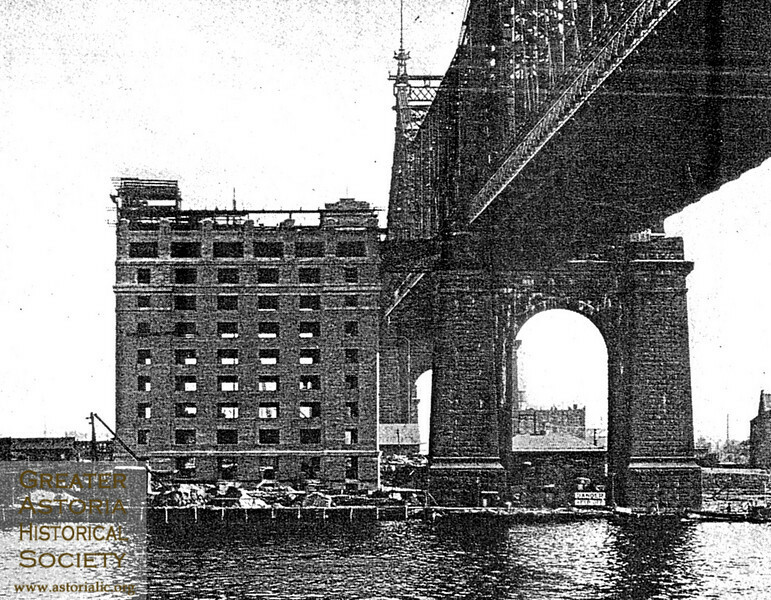 The Building pictured immediately adjoining the 59th St bridge was the original NYC Welfare Dept. headquarters, now called Public Assistance. Accessible form the Manhattan bound side of bridge, at bridge level, it was called `the upside down’ building because its 1st floor was, technically, at bridge level, and its 9th floor was at island level. It’s from this building, and its location, that the island derived its name of that time – Welfare Island. Wonderful history and great photos. Thank you for sharing!!! From the early 1950’s through 2005 my cousin Barbara (1936-2005), who had cerebral palsey, lived at Goldwater Memorial Hospital on Welfare/Roosevelt Island. 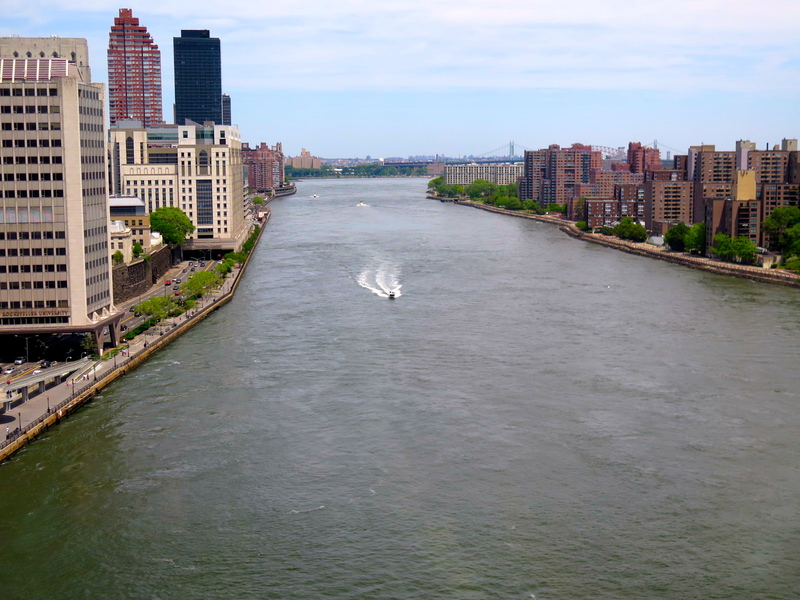 During an early visit to Barbara my family, who lived upstate in Kingston, rode the car elevator from the Queensboro Bridge down to the island. I was about eight or nine years old at the time and it was an exciting and long 200-mile, round-trip from home, especially before the Interstate Highway system. 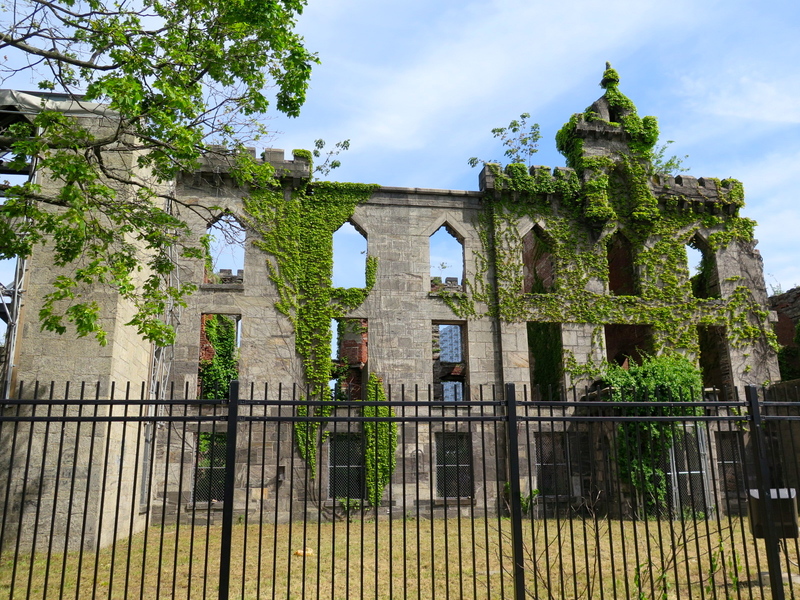 But those elevator rides from the bridge down, and back up, were eye-opening to a young boy, as was the ride over the George Washington Bridge. Barbara and I looked for the elevator some years back but could find no trace of it. And another “amusement park” ride opened when the tram initiated service, finally giving Barbara and me access to all the fun, entertainment, and restaurants that Manhattan offered, especially after the buses incorporated wheelchair lifts. So much great entertainment without Walt Disney. New York City: the entertainment capital of the world. What a marvelous story – thank you so much for sharing. I never got to see the elevators in action so you have provided a great visual to draw from! Thanks for the very helpful background, especially pictures. Have been digging for info on the QB elevators and trolleys with limited success so your research is much appreciated, as are the comments above! I was only about 6 when the trolleys ceased running, but I remember clearly that they used to be faster than the buses in the middle lanes. I loved that, because to me it was a race. And I do remember stopping at the mid-bridge elevator for passengers (mostly nurses and hospital staff) to get off & on. 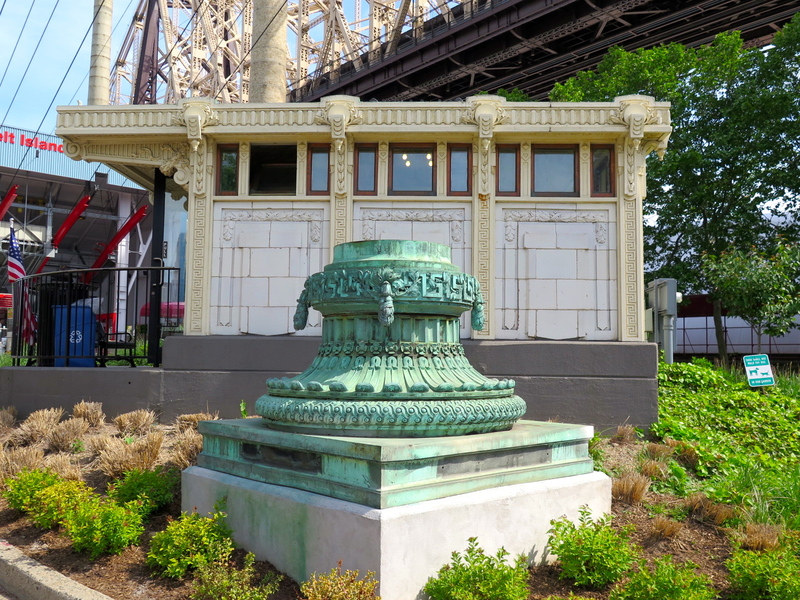 There was also an elevator inside the bridge tower on the Queens side which took people up to the pedestrian walkway. There was a pleasant elderly gentleman in a bow tie who operated the elevator. I walked over the bridge with my dad when my mom gave birth to a sister at New York Hospital on York Avenue. 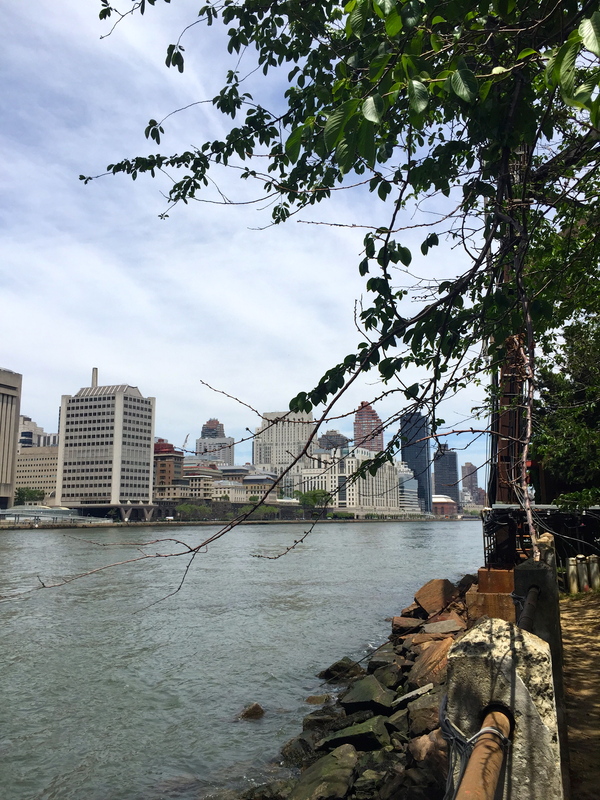 It would be great if NYC could revive some of the old trolley lines… should have never shut them down. What a wonderful memory- thanks so much for sharing it! Thank you so much for that wonderful historical story of NY. The photos were spectacular. Absolutely great.